I know many of you are gearing up for long runs and marathons this fall, so I thought now was the perfect time to share a formal recipe for one of my favorite real food running fuels: Nut Butter Stuffed Salty Dates. Want more? Check out my posts on how to fuel a long run, and what to eat before and after a run. I’ve written about my love for these in the past (while training for the Richmond Marathon, they were my fuel of choice). Not only are they delicious when you’re out there trudging the pavement, but they are easy to throw together a few minutes before you run (literally) out the door. Why do these make great running fuel? 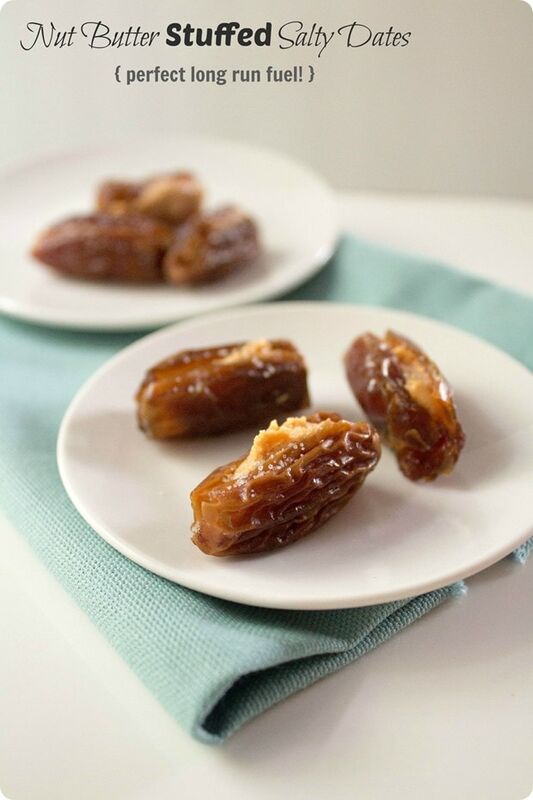 Dates provide ample carbohydrates for energy as well as potassium, which can help to prevent cramps. The salt helps replace that lost from sweat, and the small amount of nut butter helps to keep your energy levels more stable. I especially love eating these later on in my long runs, when I start to get sick of gels and more hungry for serious food (and just a little fat/protein – enough to satisfy me but not so much that it’s hard to digest while running). Everyone’s nutrition needs vary (see the end of this post for more info on figuring that out), but a good general rule is to eat one of these every 30 to 45 minutes for runs over 1 hour. Here’s the “recipe” – aka the easiest thing ever. Happy fueling! Open the date and remove the pit, if not already pitted. Stuff the nut butter inside, where the pit used to be. Add a shake of salt and pop it in a ziplock bag so you can eat it on the run! You guys know I’m normally anti-calorie counting, but for the purpose of sports nutrition, it’s important to know that you’re taking in enough calories/carbs during a workout. (And it’s really hard to eat intuitively in the middle of a really long run.) For that reason, I’ve included the nutritionals for this recipe below for your reference. Nutrition information per stuffed date: 98 calories, 2.7g fat, 156mg sodium, 202mg potassium, 19g carbohydrate, 2g fiber, 16g sugar, 1.8g protein. Happy 6 years! I can’t believe it’s been that long! Thanks, friend! You must be getting up there, too, huh?! I only blog on and off now. I am all about Instagram :) But it’s been amazing and so inspiring being a part of the blogging community for 6+ years. I LOVE nut butter stuffed dates! 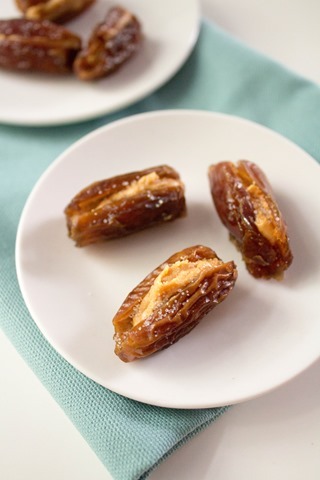 I haven’t done them with the salt on top but a nut butter filled date is one of my go-tos to calm a sweet tooth craving! For my last ½ marathon, I did PLAIN dates for fuel instead of a gel but I love the idea of adding that extra bit! Love the addition of the salt..great idea! I’ve never tried this combo, but I need to! Lol! And wow, 11 years?! I didn’t know that! Yum! 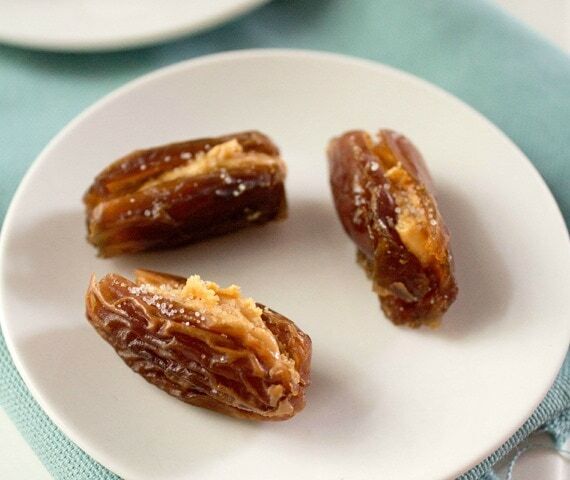 I love dates stuffed with peanut/almond butter. I’m not running right now but I read that eating dates while pregnant is supposed to help with labor/delivery so this is still a go-to snack for me! Happy blogging anniversary!! I’ve been a reader from the beginning! Love the blog! These look delicious! I’m always looking for the best and worst things to eat for both pre and post workouts. What is your ultimate favorite that is both healthy and filling? Pre workout I usually do toast with nut butter and banana. Post workout it totally varies! I just make sure to get a mix of protein, healthy fat, and carbs. Totally agree. Sad I won’t be seeing you and the others again for awhile! Sniff. I came across this article as I have my first 21km in two days! I don’t eat a lot of grain type carbs but I ‘eat loads of medjool dates and almonds etc. I was planning to bring a homemade gel of cacao powder, dates, honey, salt and chia during the run if I needed to eat (I usually do my long runs empty; most I’ve ever run was 16km). Do you think these would be sufficient for breakfast too, or stick to not eating pre-run, as I’ve done thus far? I would always suggest eating before a run! Good luck! I gave this little guy a trial run yesterday morning – not sure why it took me so long! I will for sure add the salt next time. My question – how do you avoid the messy mess? Maybe my almond butter was too running, but I had it dripping down my fingers. Ha. Hmm I guess I use firmer nut butter… but I also store them in a snack sized ziplock so if there was a mess it wasn’t in my pockets! I agree on the ziploc. I’ll just lick my fingers of the runny leftover almond butter. Thanks! I always carry them in a tiny ziplock and put them in either a fuel belt or in the front pockets of my hydration pack. I’d suggest eating one of these every 30 to 45 minutes for runs over 1 hour. Good luck and have fun out there – let us know how it goes! I’ve also tried prunes but was worried about GI issues. They both have the same amount of fibre, any concerns with eating too many? I read in another blog that the type of sugar in prunes draws water into the intestine which is why they act as a laxative, is that true? Do dates have the same sugar?